We recently needed to replace our front door handleset. I did not think it would be a difficult task, we do a lot of home projects ourselves. I purchased a handleset from Lowes and brought it home. When I tried to install it, the new handleset did not fit with the current drilled holes. I brought the handleset back thinking there are different sizes – but that would be too easy. When I arrived at Lowes with my return they told me that the newer handlesets are a few inches longer. 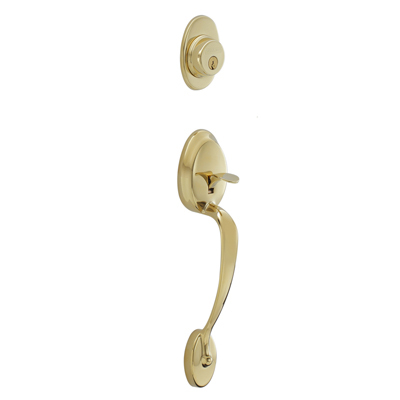 Our door and handleset was only 8 years old so its not like we were replacing a 25 year old product. Which, by the way, would be impossible because nothing built in the last ten years is built well enough to last that long! Do you know how many vacuums, dryers, dishwashers etc. I have gone through in the last 20 years?!! Don’t get me started. So I exchanged it for another handleset that was more expensive because the (very nice) man at Lowes said Schlage was the best. After my husband drilled a new hole and installed the handle everything looked great but the thumbpress did not retract, so we were locked in and locked out! We looked on their website and all through the directions trying to find out what part we must have left out and found nothing. Next I spent 30 minutes on hold waiting for customer service. When I explained what was going on they told me that this handleset had an issue and that the engineers were working on a solution! Really?? the solution wasn’t to not sell the handle until it worked? I told her that they should be recalled from the store and she agreed but said she was only customer service and would send me the part that would make it work. I asked if it would have clear directions and she said it did not come with directions but that customer service could help me. When I got the piece and called because I had no idea what to do with it, I sat on hold again. With the piece in place the door still did not seem to work and customer service said we were being shipped a new part. Ugh!! I waited a week and called again because there was no part in the mail. This time they told me I don’t need another part. At this point I asked to speak to a supervisor. When the supervisor called back she apologized about the confusion and sent me an email with the directions. Now the door works. I do think I should get a full refund on the handle at this point. The amount of time I spent on the phone and trying to get it to work was ridiculous. Note to Schlage – next time issue a recall or at the very least send out directions with the part! I can’t believe you would sell something that does not work yet. If I did that in my business my company would have gone under a long time ago. I know everyone makes mistakes but this is pretty big. On another note I just wanted to give a little shout out to my great grandma. She is in the hospital and it doesn’t look good. She is 98 and has lived a good life. Love ya Grandma Kitty!! This entry was posted on 06/22/11 and is filed under random goodies.